IPL 2019: This is cuteness at its peak. IPL 2019: It was as cute as it gets! 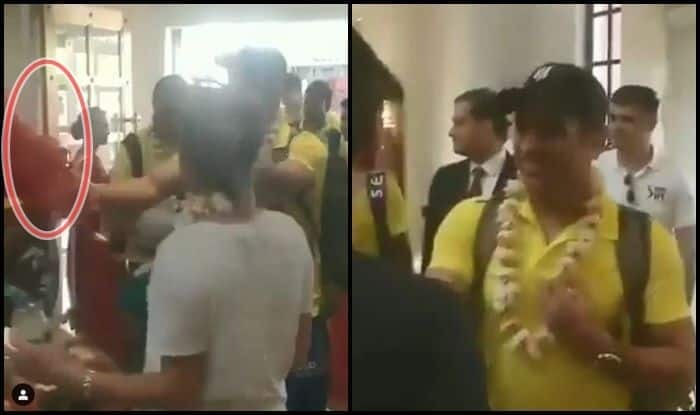 CSK skipper MS Dhoni threw a bouquet of flowers at Sakshi who was beside him after the team reached Jaipur for their next encounter. CSK are at the top of the table as we reach the midway stage of the tournament. The defending champions beat KKR by seven wickets at Chepauk. Dhoni seemed tired at the airport where he dozed off on the ground itself as Sakshi too did the same. Sakshi and Ziva have been traveling along with the team and is often seen at venues rooting for CSK. Meanwhile, it was an all-around show from CSK that helped them beat a formidable KKR.